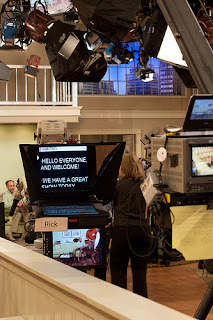 The teleprompter was invented in the late 1940s, before television was in widespread use--a device introduced ahead of its time, but ready for when its widest use and need would hit. It wasn't a speech but a soap opera where the first teleprompter was used at the tail end of 1950: The CBS drama "The First Hundred Years." An auspicious trio made it happen: Schlafly was a 20th Century Fox television research director, and he invented the device along with Irving Berlin Kahn, Fox's vice president of radio and TV and a nephew and namesake of the famous composer, and Fred Barton, Jr., an actor. If this hadn't happened, famed producer Don Hewitt, at the time producing the CBS Evening News, was considering having his anchor learn Braille so he could avoid looking down. The first politician to use the teleprompter? Former U.S. president Herbert Hoover, speaking at the Republican national convention in 1952. His ad-libs prompted him to explain that the device would need to restart--cluing the audience in to the device for the first time, live. An Emmy was awarded for the invention in 1999. Did the inventor ever use the teleprompter? Not until 2008, when he gave an acceptance speech after having been inducted into the Cable Hall of Fame. Today, you can use teleprompter tools on an iPad or mobile device, or right on your desktop--and many of those options, described in the links below, are free. Enjoy exploring this venerable speaking tool.